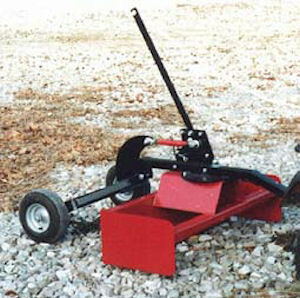 The PBX-42 box scraper helps move, grade and spread topsoil, gravel or driveway rock. Most ATVs or 12- to 22-hp garden tractors can easily pull the unit, and its clevis-type hitch connects to most hitches. Operating height is adjustable, and a pull rope lever lets users dump loads or raise to make a turn. The chassis can also be equipped with Worksaver’s landscape rake option.